OSHA has released their “Top 10” list of most frequently cited violations for FY 2011 (Oct 1 2010-Sept 30, 2011). Over the last several years the list has not changed much year to year. OSHA points out that this list is not meant to either evaluate enforcement efforts on the part of OSHA or how safe US companies have become. It is intended for organizations to take and use as a tool to improve safety at their worksites. For more information, go to OSHA’s website. Lead Article – Be honest...Are you in compliance? By now managing workplace safety and health is as accepted and assumed a part of operating a business as ordering raw materials. It‘s a rare company that doesn‘t have a proactive pro-gram in place to identify and reduce risks from fires, falls, machinery accidents and the like before they actually cause injury or result in fines from regulators. Companies have also operated for years under environmental safety and health laws and rules, but programs for managing those risks are much less prevalent. That‘s what Tom Odegaard, president and executive director of the Seattle-based Evergreen Safety Council, heard from personnel at member companies involved in managing safety and training programs. So ESC, which runs such certification and training programs as motorcycle and forklift operation, plans to start a new series of courses to get companies up to speed on running their own environmental health and safety programs. The three-day course will launch sometime in early 2012 with a focus on clean air, clean water and hazardous wastes. To date many companies have been in a reactive mode, dealing with environmental issues only when inspections and fines are involved. “They want to put together a program so they‘re not reacting, so they‘re ahead of the game a little bit,” Odegaard says, so that if inspectors do show up at the door they can point to specific measures they‘ve taken to mitigate risk and be in compliance with rules. The program will have application not just to manufacturing and construction businesses, which are dealing with issues such as managing storm water runoff from their job sites, but service companies as well. “If you have a fleet and you have a shop that takes care of that fleet, what are you doing with and how are you treating all the fluids that you change to prevent that from getting into the storm water and eventually (into Puget Sound),” Odegaard says. The good news is that there are measures companies can implement without breaking the bank, he adds. Odegaard says the course will include speakers from agencies involved in environmental regulation. Participants will be given reading material in advance of the sessions. ”We‘re trying to be respectful of time away from work,” he says. Evergreen’s Eric Tofte and intern John Neibel started November off with some onsite training. We spent the first two days of the month working with a local utility company; their employees welcomed us with warm wishes even though it was literally freezing outside. 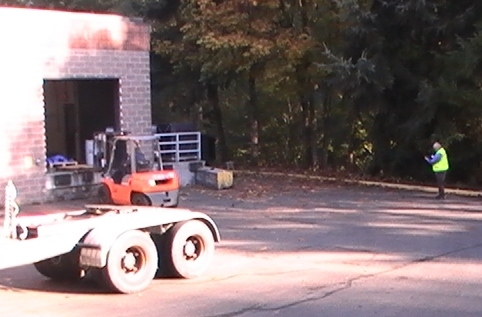 Approximately 30 people were recertified to operate the forklifts at this location over two days. ﻿﻿ Some things to note from the class: most of us have our bad habits when it comes to operating Forklifts, but we kept seeing some more than others and they warrant mentioning here. 1) When backing look over both shoulders to ensure that there are no obstructions or personnel in the area behind the lift. We noticed that almost everyone likes to look over their right should, but never looked to the left. 2) Keep all body parts inside of the cab of the forklift. This means - no you cannot hang onto the frame of the overhead protection or hang onto the side of the forklift to steady yourself. A small impact could cause a very serious injury. 4) Horns are there to be used—even though the machine has a back-up alarm. Use the horn to raise the level of awareness of the hazard that is presented, use the horn at any and all blind corners – if you can’t see around it, then they cannot see you; let them know that you are there. ﻿﻿ In July of 2011 DOSH (L&I ) released a new directive on emergency washing facilities DOSH Directive 13.00 , this new directive is primarily meant for the inspectors. It tells them what to look for when citing businesses for not having the correct washing for up for their location and hazards; however at the same time it provides guidance to all who are not sure if they need the emergency washing facilities. So take a look at this directive and see if you might need to update your location and or type of emergency washing facility. Emergency washing facilities, WAC 296-800-15030 through -15040. Emergency Washing Facilities (366 KB PDF) DOSH Directive 13.00. If you have questions, we can help, give us a call 800-521-0778. As some of you know, I tend to harp on lockout/tagout issues a lot of the time. Well there is a reason for this, many workers get injured when they fail to properly lockout, tagout and try out of a piece of equipment they are going to work on. A 21-year-old is not expected to regain the full use of his hand after it was caught in a clogged dust collection machine. Four fingers were broken and the skin from two fingers and the back of his hand was removed when the machine was started by the victim’s supervisor. The victim’s hand was caught in the fan as he tried to reach the blockage. Earlier, the victim’s supervisor tried to reach the blockage but was unable to. The victim then tried, believing his longer arms could reach the blockage. The supervisor was unaware that the victim’s arm was inside the machine when she started it. The worker was from a temporary help agency and was employed one month at the storm water filtration equipment manufacturer when the incident occurred. The company had a lockout/tagout plan in place to prevent these injuries. The victim had not been trained in the lockout/tagout plan. The victim is likely to be out of work for more than six months. If you would like to read the entire hazard alert, please follow this link.